The nicest looking lawns throughout Calgary whether on a private, municipal, or commercial property usually have a thing or two in common. First, they are usually properly maintained by professional landscapers and secondly they probably implement some type of seasonal feeding and lawn fertilization program to keep the lawn in a very healthy, lush, green state during our shorter growing season. Essential Property Maintenance has a team of experts, ready to evaluate the needs of your property. To ensure your lawn grows green and healthy, high-quality fertilizer and regular feedings are very important. When applied at the correct time, a high-quality lawn fertilizer gives your grass all the essential nutrients that it needs to grow lush, thick, and resistant to external stressors – like weeds or pests. Let out team of experts determine what is best for your lawn! 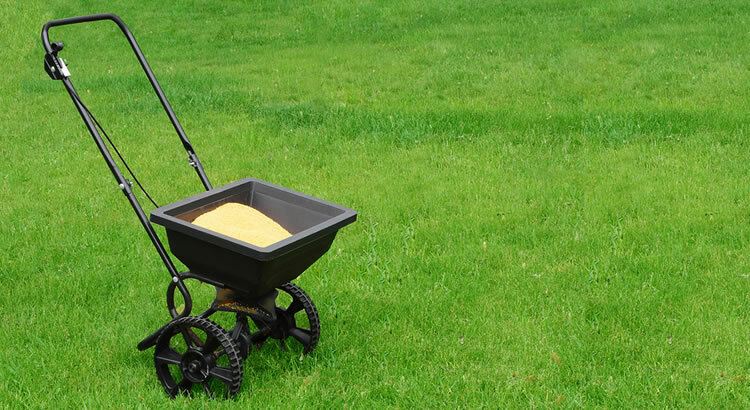 What Does Your Lawn Need For Fertilizer? Like all plants, your lawn thrives on the elements NPK. This stands for Nitrogen (good for lush green growth), Phosphorus, and Potassium. Your grass requires these elements and other trace elements in varying amounts throughout the year. For example, in the spring when growth is happening very quickly your grass will need lots of Nitrogen, more so than other elements. Fertilizing shouldn’t be done just once. If you want a healthy looking lawn then it needs to be fed regularly usually in 4-6 week intervals for the best results. There are literally thousands of lawn fertilizing products on the market, but there are only a select few that we use that we know work exceptionally well in Alberta’s climate. The first step is an initial visit to your property to determine the state of your lawn and the type of attention it might require. Many of the lawns we visit for fertilization are well beyond the point of bringing them back with fertilizer alone and in some cases require lawn replacement, we’ll tell you if that’s the case. We check out the health of your lawn and determine a suitable schedule. We show up on the scheduled day and complete our services as promised. The end result will be a well-fed lawn that is nice, lush and green! After we’ve visited your property and discussed the project with you we’ll be to provide you with an accurate cost estimate to regularly fertilize your lawn.